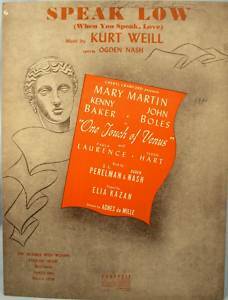 “Speak Low” was written for the 1943 musical One Touch of Venus, where it was introduced by Mary Martin and Kenny Baker. In addition to several very fine Tony Bennett recordings, “Speak Low” has been widely recorded by jazz and popular performers, including Ella Fitzgerald, Billie Holiday and Lena Horne. Speak Low was recorded on November 11, 1959 and was released in 1960 on the album To My Wonderful One. It was arranged by Frank DeVol. Speak Low was recorded on March 13, 1962 for On The Glory Road, which was to be released in 1962, but was canceled. The song was arranged by Ralph Sharon. “Speak Low” was recorded live at Tony Bennett’s concert at Carnegie Hall on June 9, 1962 was recorded live at Tony Bennett’s concert at Carnegie Hall on June 9, 1962, but was not released until 1997 on the album Tony Bennett at Carnegie Hall: Complete Concert. Ralph Sharon arranged the song. “Speak Low” was recorded on March 26, 1964 and released in 1964 on the album When Lights Are Low. It was arranged by Ralph Sharon. “Speak Low” was recorded in May, 1989 and was released the following year on Astoria: Portrait of the Artist. It was arranged and conducted by Jorge Calandrelli. “Speak Low” was recorded and televised live on April 12, 1994 on MTV. The MTV Unplugged album was released in June of that year. The songs from the televised concert were arranged by Tony Bennett and the Ralph Sharon Trio. “Speak Low” with Norah Jones was recorded in 2011 and was released that year on Duets II. It was arranged by Jorge Calandrelli.